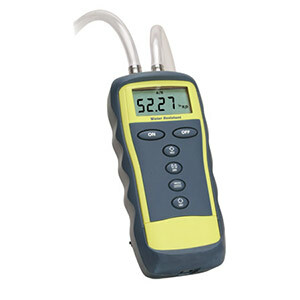 OMEGA’s HHP-90 is a rugged handheld instrument ideal for replacement of conventional U-tube manometers. It features high accuracy and resolution, fast response time, and selectable engineering units all at an economical price. Manufactured from ABS plastic, this water-resistant instrument is supplied with a protective rubber boot to provide added protection. The case has a built in tilt stand and magnetic mounting for ease of use and the back lit LCD display allows easy viewing even in poor light conditions. Please review product pdf for complete details! 15.2 m (50') of vinyl tubing, 3/8" O.D. x 1/4" I.D. 注: Comes with batteries, rubber boot, tilt stand and magnetic mount, and complete operator’s manual.